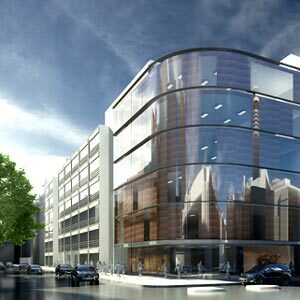 Tenders are being invited for building a £150 million innovative Proton Beam Therapy (PBT) cancer treatment centre in central London. University College London Hospitals (UCLH) has invited prequalification submissions for the project, part of a wider plan to provide leading edge cancer treatment facilities across the UK that is supported by £250 million of government funding. Another PBT centre is planned for the Christie NHS Foundation Trust in Manchester and together the facilities aim to treat up to 1,500 cancer patients a year. Tenders will be invited for the UCLH project from a shortlist of four companies in June with construction works planned to start in Spring next year for completion in 2018. The PBT centre will be a 25,000 sq m development with four below ground levels housing the treatment centre and five floors above ground providing a state of the art patient facility, with patient beds and operating theatres. The new development will be linked to other hospital facilities in the area by an existing network of tunnels. The PBT will be built on a site at the junction of Grafton Way and Huntley Street in the Euston area. Planning permission for the development was granted in March last year by Camden Council and following approval from the Greater London Authority building work could start in Spring 2015. PBT is a type of radiotherapy that uses a high-energy beam of protons rather than high energy X-rays to deliver radiotherapy doses with reduced dangers of side effects, especially in children and young adults. The new hospital will allow patients to receive this cancer treatment in the UK for the first time as currently cancer patients have to travel overseas to receive it.